Dignitas provides the foundation for our students' entire college experience by introducing them to the key elements unique to a St. Scholastica education. Dignitas, the Latin word for dignity, is the program's signature element focusing on the intrinsic, absolute value of being a person. Who am I in community with my neighbors (locally, nationally, globally)? Human dignity is the idea that every person is an end-in-itself who ought never to be treated merely as a means. It is the foundational moral principle--the criterion by which we evaluate all other moral claims. Human dignity is about honoring and respecting each other as persons created in the image and likeness of God. The College of St. Scholastica is a Catholic Benedictine community that welcomes people from all cultures and faith traditions. CSS prepares students to live and work in a diverse and expanding world. In Dignitas, we provide our students with a context for thinking about diversity and with a framework for understanding how our individual identities impact relationships. At CSS, we are standing on the shoulders of giants and we have the unique privilege of upholding the Benedictine tradition. 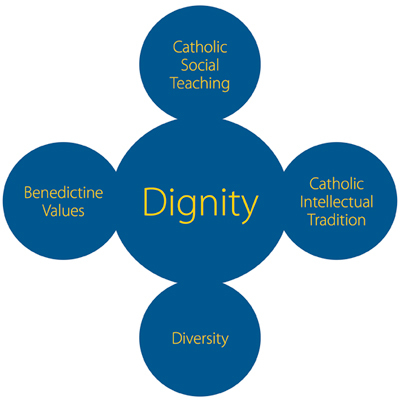 To be Benedictine means actively and intentionally living out our values on a daily basis. The Catholic Intellectual Tradition affirms the value of rational inquiry and the human search for truth and meaning. In the Catholic Intellectual Tradition, faith and reason complement each other in a never-ending quest for wisdom. The Catholic Intellectual Tradition (CIT) represents a disciplined exploration into the human condition in light of divine revelation as received by the Catholic faith community. Throughout its extensive history, the CIT has conducted this exploration in a variety of ways, utilizing the totality of human faculties and experience. As a result, the CIT has taken as many forms as there are ways of exploration, including not only formal expressions, as found in academic disciplines and artistic achievements, but also informal, as in folk beliefs and social movements. Dignitas Labs, therefore, offer students, faculty and staff alike the rare privilege of exploring the rich diversity of the CIT. Catholic Social Teaching challenges our community to live in justice and peace. Catholic Social Teaching examines the radical idea that God calls us to live simply, sustainably, and in solidarity with ALL people-especially the poor.